In 2017, MDOT announced $7 billion in Baltimore Region Transportation Investments including adding new lanes to 27 miles of I-695 and I-95, and a transformative project to add four new lanes to the entire length of the Baltimore Washington Parkway (MD 295), from Baltimore City to Washington, D.C.
MDOT/MdTA committed $210 million to extend 7.75 miles of the northbound I-95 Express lanes (one additional lane) from north of MD 43 in Baltimore County to MD 24 in Harford County. 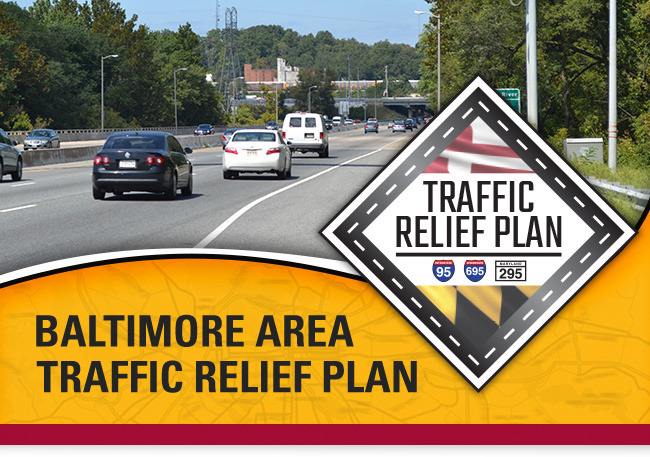 MDOT has committed $151 million for innovative congestion relief efforts on both the inner and outer loops of 19-miles of I-695 from I-70 to MD 43. $100 million has also been designated for the design and construction of a new configuration of the I-695 and I-70 interchange, often referred to as the "triple bridges." MDOT is seeking to transfer ownership of MD 295/Baltimore Washington Parkway from the U.S. Department of the Interior to the Maryland Transportation Authority to build, operate and maintain four new express toll lanes and upgrade and maintain existing lanes between Washington, D.C. and Baltimore.